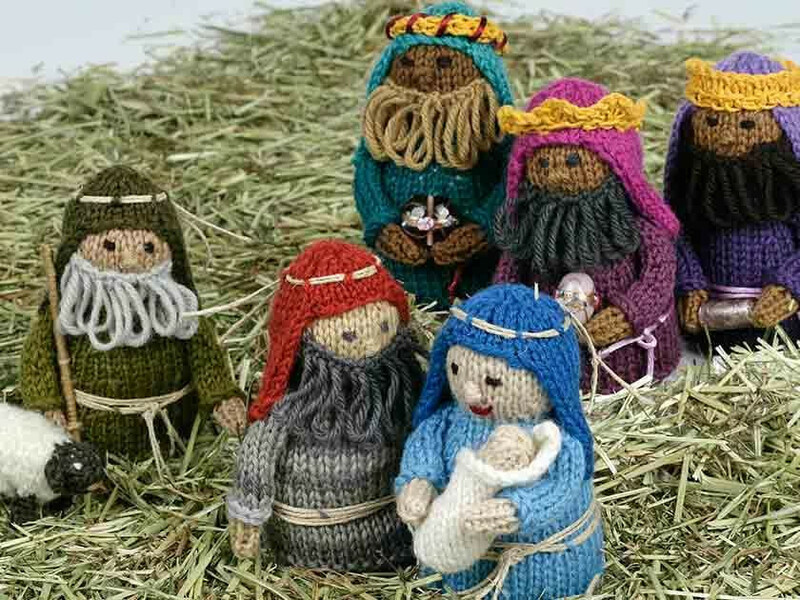 Knitting Network followers and Woman's Weekly readers it's soon time for our special Nativity Knit Along! Read on to find out more about what's in store. Each week we will release a new character to this famous winter scene, there are four stages with each one being a pattern for the different characters. Starting with Mary and baby Jesus. Baby Jesus looks very cute and cosy wrapped in a blanket. He is very simple to make, too! The second pattern to be released will be Joseph. He is made using grey and red yarn, and making loops using a safety pin creates his beard. Joseph, Mary and baby Jesus all look lovely together, the beginning of a great looking Nativity scene. Next up are the Shepherd and his sheep. This pattern follows a similar format to Joseph (so you'll be a pro by the time it comes to knitting him), however his robe is green and beard is grey. He is accompanied by a tiny sheep, made with a small amount of cream yarn and a shepherd’s stick which is created using a small wooden skewer with yarn wound around it. The sheep creates a cute addition to the Nativity. For Mary, Joseph and the Shepherd you will need some string to wrap around their heads and waist. And finally, no Nativity scene is complete without the Three Kings! Each king has a different coloured robe and a crown made from a small amount of gold DK yarn. They all carry a gift each for baby Jesus, which are decorated beads sewn on to the king’s hands. An effective detail that completes the Three Kings’ look nicely! You may have your own beads that you want to use but we think this set of three antique beads would work well. If you are in need of some gold yarn we recommend this stranded double for an extra regal sparkle on the king's crowns. The kings also require a small amount of ribbon cord for their belts and headdress. recommend Berisford Rope Ribbon Satin Cord. We will be sharing the links to download the patterns on our Facebook page bright and early every Friday over the next four weeks. These posts will also have detailed step by step blogs to help you along the way! Don’t forget to share your progress pictures on The Knitting Network Facebook page, we always love to see how you’re getting on!